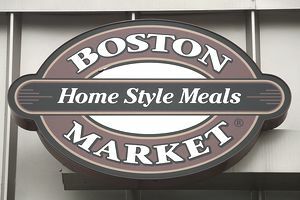 Boston Market is a chain of "fast casual" restaurants, specializing in rotisserie chicken and other meat entrees, along with a variety of side-dish choices. The founders, Arthur Cores and Steven Kolow, were residents of Boston and graduates of the city's Northeastern University. The pair was looking to start their own business, and Cores had managed a grocery store and a catering company, while Kolow's experience was in real estate. With the former working with food and the latter knowing about real estate locations and purchases, building a restaurant chain seemed like a natural fit. Boston's reputation as a tweedy, collegiate city, prior to the Matt Damon and Ben Affleck movie-script rewrite of its image as a more hardscrabble, working-class, led to areas such as Cambridge, Brookline, and the partners' home base of Newton having upscale shops, including gourmet food stores. "I saw the trend in gourmet shops that people wanted to buy plain, simple, everyday foods," Cores told an interviewer. Their idea was to provide food that was as fresh and healthy as that served in those stores but delivered as fast as fast food, with the price considerably closer to that of fast food. In 1985 the founders rented an empty store in Newton, bought rotisseries to roast the chickens, collected recipes for side items like mashed potatoes, garden vegetables, and cornbread, and opened the first Boston Chicken store. The store was a runaway success. Word of mouth led to articles in the Boston Globe, and the line extended well out the door. In 1989 George Naddaff, who had opened the first Kentucky Fried Chicken store in the Boston area, checked out Boston Chicken. He kept coming back because he loved not just the food but also the restaurant model and wanted to acquire the company to grow it into multiple locations. Naddaff persisted in wanting to buy the business, so while previously unwilling to sell out, Cores and Kolow believed in Naddaff and ultimately sold him the company. Naddaff kept Cores on to help run New Boston Chicken Inc., while Kolow maintained control of the original Newton restaurant. By 1991 the average Boston Chicken store was making $800,000 a year. At this time, Saad J. Nadhir, a Blockbuster Video executive, followed Naddaff's pattern, seeing the line coming out of a Boston Chicken store. Impressed, he and his Blockbuster partner Scott Beck bought the chain, and by the end of 1992, there were 217 stores throughout the U.S., making $154 million in annual sales. At this point, the company's headquarters was moved from its namesake city to Golden, Colo., where Beck had also moved. In 1995 the name was changed to Boston Market, to reflect the fact that the stores now sold other meats as main courses, including turkey, ham, and meatloaf. By the spring of 1997, the company had over 1,100 restaurants and over $1 billion in annual sales. But the attempt to expand into the international market stretched it too thin, and a great deal of debt was raised to finance this effort. In October 1998 the company filed for Chapter 11 bankruptcy, and nearly 400 stores would be closed. McDonald's bought Boston Market on May 2000 for $173 million. With the McDonald's business team behind it, Boston Market was able to rebound and had started selling some of its items as frozen food packages in supermarkets, seemingly a contradiction of the original owners' message. In 2007, with the number of restaurants stabilized at over 500, McDonald's sold the company to Sun Capital Partners. As of 2015, it had 452 stores and was doing over $600,000 in annual revenue.